From first launch, this unique annual event is being billed as the most important nautical/marine show in the Los Cabos destination as well as Baja California Sur, Mexico. Principal nautical products and service providers, marinas and resorts, as well as sailing and yachting enthusiasts from the U.S., Canada and Mexico will converge on the Marina Golden Zone of the Cabo San Lucas marina, in a venue they won’t soon forget. Official event sponsors include Marina Fiesta Resort & Spa, Luxury Avenue Boutique Mall and Puerto Paraíso Mall, which together form the Marina Golden Zone in Cabo San Lucas. Supporters include Los Cabos Conventions & Visitors Bureau, Los Cabos Municipality Tourism Dept., Marquis Los Cabos Resort and Sheraton Hacienda del Mar Resort and Mexico Living. 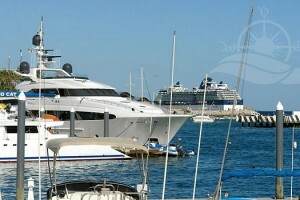 Cabo Marine Show 2010 boasts an extraordinary exhibitor area, set in the heart of the Cabo San Lucas’ Marina Golden Zone. Charter companies and water activities promoters—sportfishing, boating and luxury yachting—as well as resorts and marinas, hotels and world-class golf courses will offer their products and services to the select Los Cabos local and travel market, its visitors and the eyes of the international travel media, in a venue that is sure to offer something for everyone. This is a two-day event you won’t want to miss! Times are Friday, April 16, noon to 9 p.m., and Saturday, April 17, 8 a.m. to 9 p.m. Admission is FREE to the general public. The Cabo Marine Show was awesome this year! Looking forward to next year's event!